Orlando, El Paso, Chicago. 3 trips over 2 months. Planes, trains & automobiles (quite literally). This is part 1 of a summer travel series: planes. For many, Independence Day means traveling. I figured that air travel is probably the most popular, so Part 1 of the Summer Travel Essentials is focused on what to pack in your carry on. 1. iPod + battery | Stock your iPod up with some fun summer tunes, or better yet, make a summer playlist! Don’t forget a spare battery so you’re powered up and ready to go when you reach your destination. 2. computer + charger | I usually don’t like to travel with my computer, but sometimes it’s necessary. Great for watching a movie on the plane! 3. empty water bottle | Since there are so many liquid restrictions through security, I always bring an empty bottle to fill up at a water fountain. I’m loving this cute mosaic elephant! 4. headphones | So the whole plane doesn’t hear your tunes or movie. 5. kindle paperwhite + case | I absolutely LOVE my Kindle paperwhite. No need to lug 6 books, just download them and you’re good to go! Own a Kindle? Check with your local public library – you may be able to borrow books for free! 6. bars | I never go anywhere without a snack in my bag. My recent favorites are Larabars. I eat one pretty much every single day. 7. notebook + Sharpie pens | For when inspiration strikes! Or just a list you need to make. I always carry a notebook & my favorite Sharpie pens (in a variety of colors). Bonus: I usually carry my Lo & Sons laptop tote, that is no longer sold. But the O.M.G. bag is a great alternative. 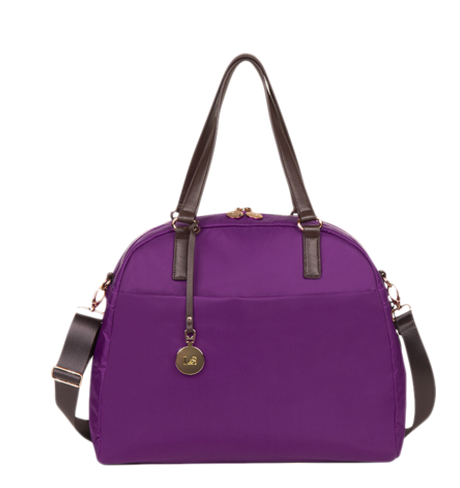 I love the purple color! Did I miss anything? 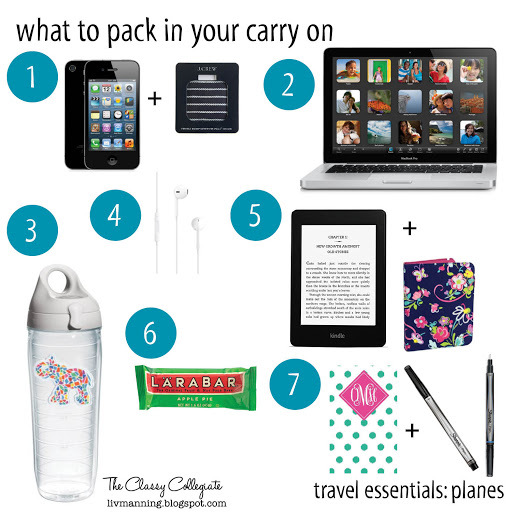 What do you pack in your carry on bag? P.S. Check out some patriotic outfits to get you in the holiday spirit!